What’s a picnic without tea, right? Instead of having a boring old thermos, enjoy ZENS portable set’s infuser packed glass teapot that comes with a pair of double walled tea cups. This aesthetically marvelous set can be the perfect complement to the serenity of your outing – and of course, the tea is kept warm and fresh. Work can be tough – and stressful. You can smuggle your tea set into the office, and enjoy a soothing cup of jasmine tea along with some equally sweet office gossip with your favorite co-worker. It’s easy to bring the set in thanks to its specially designed carring case, equipped with fitted slots for the set pieces. The ZENS Lifestyle Portable Tea Set is also a dream come true for neat freaks – the infuser is built into the lid and crafted from food grade silicone, which facilitates convenient pouring and makes it easy to clean. 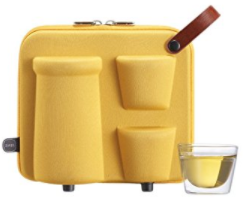 This portable set can make the life of a tea lover far more appealing – and if that screams you, you’ll be sure to love it.